Generally, the breeds of dogs from the Northern areas are known for their strength and endurance and the Alaskan Huskies are no exception from the rule. They are often used for sledding, be it in contests or day to day activities. The nature of an Alaskan Husky makes him seem a dog seeking isolation, even being shy at times, but the truth comes easily to light when this dog is among the people he loves, playing in the backyard. Despite their solemn attitude, they are very friendly and enjoy the company of people, sometimes even that of strangers, which disqualifies them as good watch dogs. They aren’t the barker type, but they do howl on occasions. Huskies aren’t very fond of food in general and sometimes they leave their bowls of food untouched for several days. With this in mind, the owners need to try several types of food until they find something these dogs will definitely fall for. In most cases, the right answer when it comes to food is not the canned food. Although calm and friendly, Huskies are not the best choice for homes where children are present. However, if this is the case, it’s important the Huskies and the children make their first contacts at a very early age, so that they can socialize and learn to get along well. It’s important for a Husky owner to know and remember that this dog is made for running, so a high level of physical activities is highly recommended. They love to run and are good companions when running or riding the bike, but they are also happy when walking. If they lack exercise, they are very likely to become victims of obesity. The average height for an adult Alaskan Husky ranges between 55 and 65 centimeters, while the weight ranges between 35 and 40 kilos. Used to extreme northern conditions, their coats are usually long and also have an undercoat as a second level of protection against adverse weather conditions. 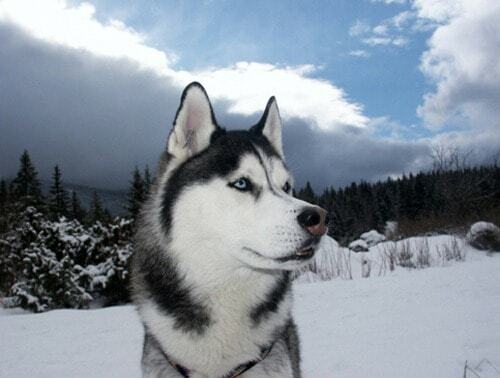 The colors of a Husky will only be white, gray and black in combinations, but only white when a single color. The Huskies can be considered difficult to take care of only because they need a high level of physical exercises in order to prevent obesity.